MFCC received an annual donation of food hampers from Hope Church just before Christmas. The hampers are made up by Hope Church for individual families most in need in the safe houses and out in the community, catering to the size of the family and age of the children. 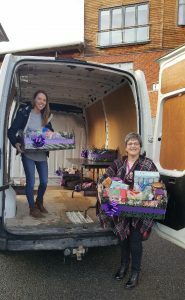 A client from the female safe house said “The hampers are amazing, I can’t tell you how grateful we are, there was even a fresh turkey in there, as well as loads of other food and the kids loved the way the box was decorated. Thanks to all at Hope Church”. MFCC trustees, staff, volunteers and clients would like to send our sincere thanks to Hope Church for their continued support, Christmas can be a hard time for people experiencing domestic abuse and all donations make it just that bit easier.